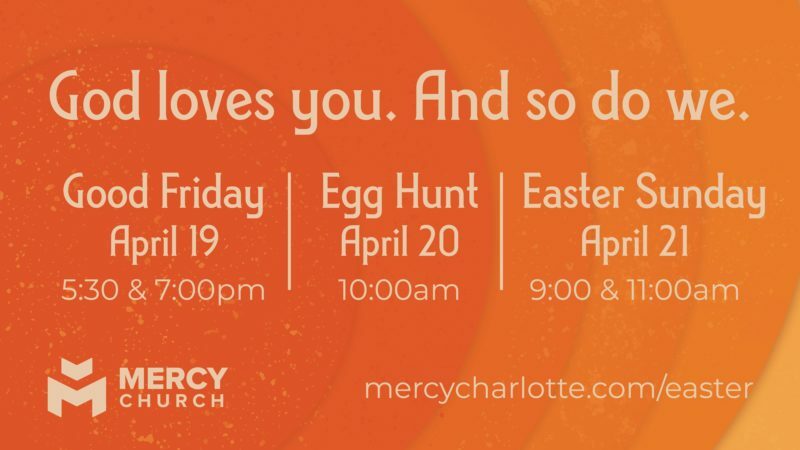 JOIN US FOR EASTER WEEKEND AT MERCY CHURCH! Good Friday is a reflection on the crucifixion and sacrificial death of Jesus. Remembering the price that Christ paid out of love for us is one of the most impactful ways we prepare ourselves to celebrate the incredible news of Easter Sunday! We will hold two, hour-long, worship services. This is a family friendly way to enjoy community during this Easter weekend. We will have prizes, games, candy, music, and more! Come join us and bring your family and friends with you! Christianity is a religion founded on a historical event: the resurrection of Jesus. Easter Sunday is when we celebrate Jesus rising from the grave and defeating death forever! We will hold two services at both of our locations, and we want you to join us. Come just as you are!